Henry Medley (1687 – 5 August 1747) was an officer of the Royal Navy, rising to the rank of vice-admiral. Medley entered the Royal Navy in 1703, and in 1706 was midshipman of the 80-gun HMS Somerset with Captain Price at the relief of Barcelona. He passed his examination as lieutenant on 8 February 1710, and on 5 September 1710 was promoted by Sir John Norris to be lieutenant of HMS Fame; a few months later he was moved into the 70-gun HMS Stirling Castle. In 1717 he was a lieutenant of the 90-gun HMS Barfleur, flagship of Sir George Byng in the Baltic Sea. Early in 1720 Medley was promoted to the command of HMS Poole, a fire-ship, and on 17 February 1721 was posted into the 60-gun HMS York. In 1722, while commanding the 50-gun HMS Leopard in the Mediterranean, he seized a ship named the Revolution, lying within the mole of Genoa, on information of her being in the service of the Old Pretender. He later commanded the Leopard on the coast of Portugal and in the English Channel until the end of 1728. 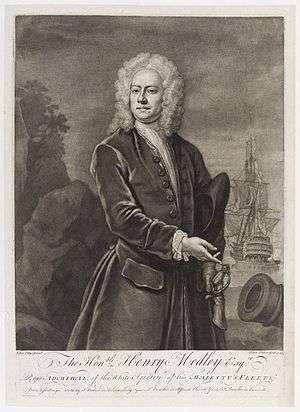 In 1741 Medley commanded the 70-gun HMS Nassau in the Channel Fleet under Sir John Norris, and in 1742–4 was with Norris as captain of the fleet. On 19 June 1744 he was promoted to be rear-admiral of the white, and in the following winter commanded a squadron cruising in the Channel Soundings for the protection of trade. On 23 April 1745 Medley was promoted to be vice-admiral, and sent out as commander-in-chief in the Mediterranean. The service was one of blockade and co-operation with the allied armies in the War of the Austrian Succession, who in the winter of 1746–7 invaded Provence; but, after an unsuccessful attack on Antibes, they were obliged to retreat. On 15 July 1747 Medley was advanced to be Vice-Admiral of the Red. He died, probably not knowing of the promotion, on board the 80-gun HMS Russell, at Vado Ligure, on 5 August 1747. George Rodney served with him on two ships at the beginning of his career with Medley acting as a mentor to the younger man. A monument in Medley's memory, attributed to William Tyler, was placed in York Minster. a. 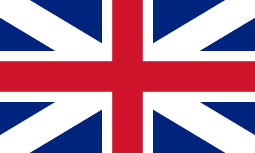 ^ Some sources indicate that the governor in 1740 was Lord George Graham. There is no evidence to support this appointment. 1 2 3 4 5 6 "Medley, Henry". Dictionary of National Biography. London: Smith, Elder & Co. 1885–1900. ↑ The Scots Magazine. Sands, Brymer, Murray and Cochran. 1739. p. 282. Retrieved 26 February 2013. ↑ "The Late 17th And Early 18th Centuries". The York Guides. yorkguides.co.uk. Retrieved 9 August 2012. This article incorporates text from a publication now in the public domain: "Medley, Henry". Dictionary of National Biography. London: Smith, Elder & Co. 1885–1900.